Water water everywhere… Many times I remind struggling watercolorists to remember that it’s ‘WATER’color. 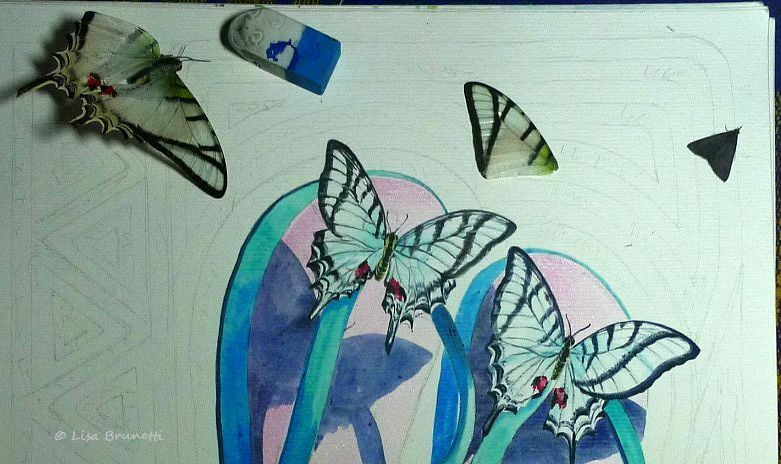 One wants the white of the paper to enhance the painting and make the colors glow! I prefer to work from life, so I searched the yard in hopes of finding a butterfly. How thrilled I was to find this one, broken wings and all! “Happy Shoes” (above) presented a few challenges. Remember that a purist does not use white pigment; the white of the paper speaks for itself! “Museum Guardians” (below) greets visitors who visit this blog. 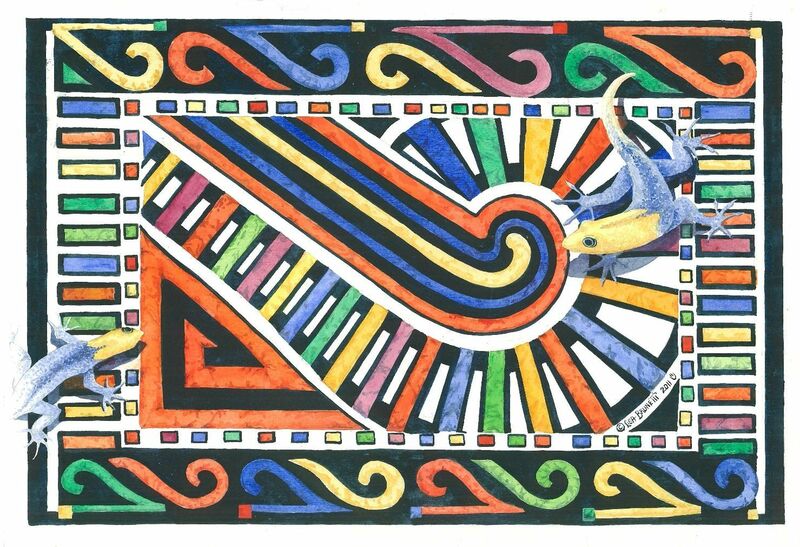 The watercolor design blends two pre-Columbian artifacts from the Jama Ecuador museum and rolls them into a bright colorful design. Not one to use masking fluids, I enjoyed the challenge of working the dark areas against the lighter ones. “Guarumu’ (cecropria) leaves are a favorite of howlers, though the monkeys eat the stem and then drop the leaf to the ground! An old one, this watercolor (below) was painted from a photo taken of friends’ beach chairs and given as a surprise birthday present. Many memories are attached to paintings like this! Some people ask how I glued the pottery to the paper! 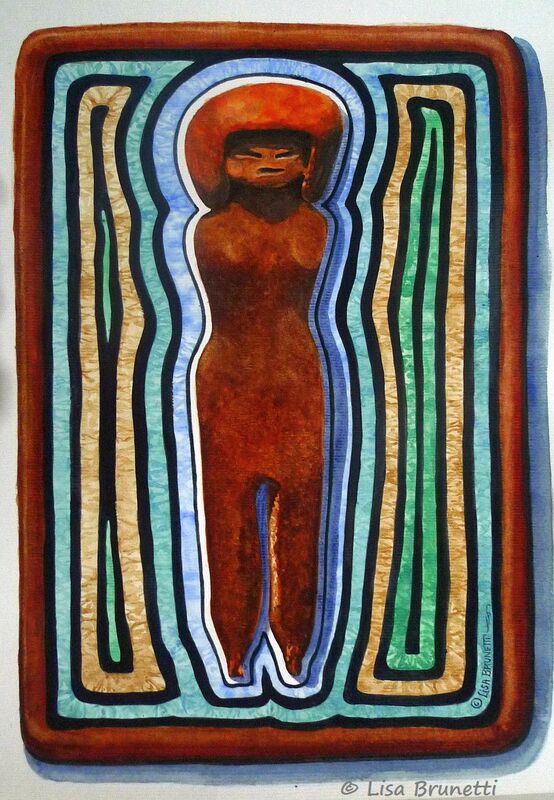 Senorita Valdivia, inspired by an artifact in the Bahia de Caraquez Museum, is the first of a new series of paintings for a 2014 exhibition. Given permission to visit the three museums of Manabi Province on “Closed to the Public” Mondays, I can work in blissful silence! 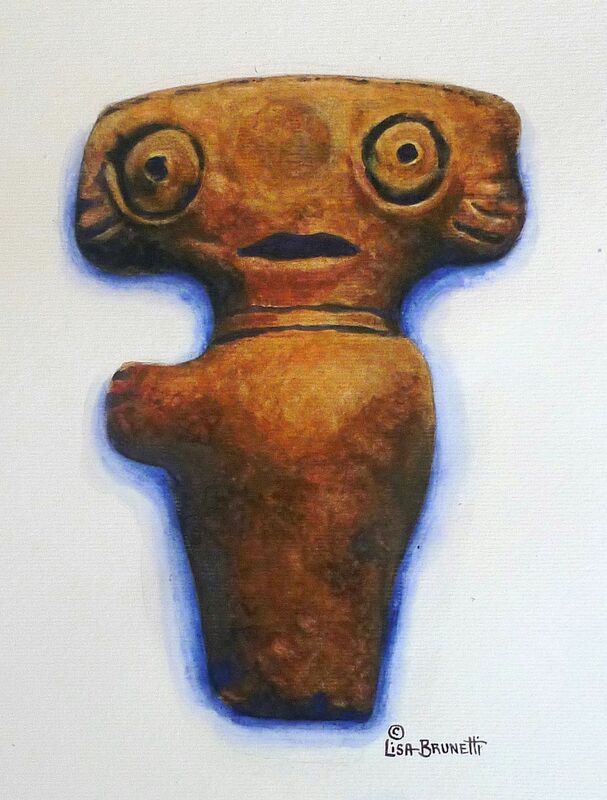 This artifact from the Bahia Museum earned the nickname of “ET.” Do you think that an ancient astronaut modeled for the original artist? All I can say – again – is that artists amaze me. I do love watercolor, and yours are so vibrant, so lively. “Some” day, who knows? I may find opportunity to try it myself. In the meantime, I’ll just enjoy your work! “Some” day seems to be that carrot that dangles and taunts us; you surely have the same problem as I — our lives are so full that we never have enough time to pursue all that we’d like to do! I have so many posts patiently awaiting in the incubation chamber, and they share that space with countless ideas for paintings. There are new fruits and vegetables always hoping for their time to star in culinary experiments, and there are birds to watch, fish to catch, flowers to plant, furniture to make (driftwood from playamart!) people to see, places to visit…. My cup runneth over! Ah! I hope that you follow those internal nudgings and find your way back to your art. It’s hard to return to a half-finished painting. Theh spontanaety seems to be lost. I usually start a new one, and after a few hours, switch between the new and the old, and soon there’s a new injection of energy for the old one. If there were bad ‘things’ going on in my life while painting, I seem to tap into those negative feelings again when I resume, so usually I abandon those or burn them.. if a canvas, i paint over them and start fresh. Ask yourself why you lost interest; if bad feelings are attached, it might be best to start with a new one! you are so welcome, and i hope that you find a suitable place soon! Absolutely stunning z! I love your work. “Happy Shoes” is off to a nice start. 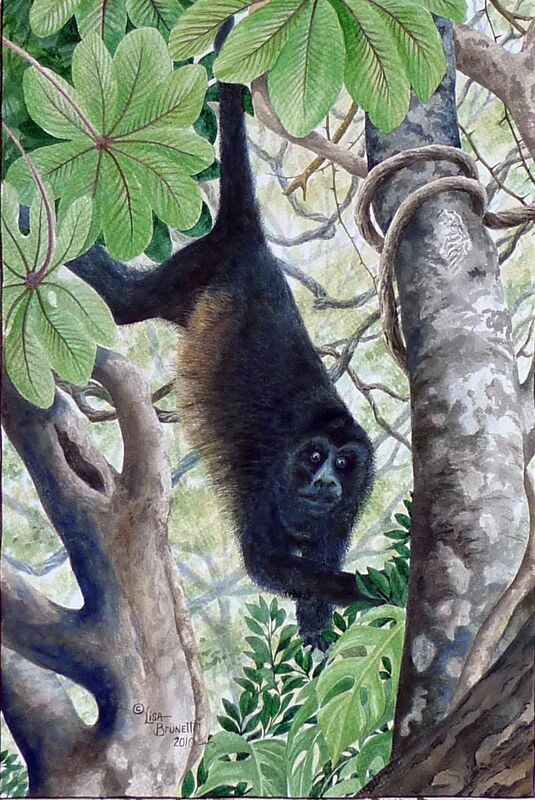 I enjoy all of these, but am really taken with the howler monkey. Handsome fella’. thank you so much! The shoes turned out well and were part of “The Mola Series.” years ago my focus was wildlife, and i still enjoy painting flora and fauna! good decision, to use a fragment as header! my artist friend in new york/new mexico asked how i got the paint to stick to the floor tiles! it’s fun when someone walks into the house and tries to wipe their feet on the ‘rugs’ – they look down in disbelief then touch the floor with their fingers! Ha! Thank you! There are several animal paintings (studies) incubating. i’ll have to paint them soon! You always inspire me. The first suitcase I packed for Ometepe was filled with my watercolors, paper, and paintbrushes. I’m ashamed to say, I haven’t touched it. Building houses, searching for pottery shards, and raking mangoes have kept me busy. Yet, something has been missing in my life…your blog reminded me to take time for myself and open the suitcase with my artist supplies. I finished my permanent marker mola, and I started painting gourds that I grew over a year ago. I’ve been in incubation too long…thanks, Z for your inspiration. I wonder if I would have started my art work again if I had never discovered your blog? 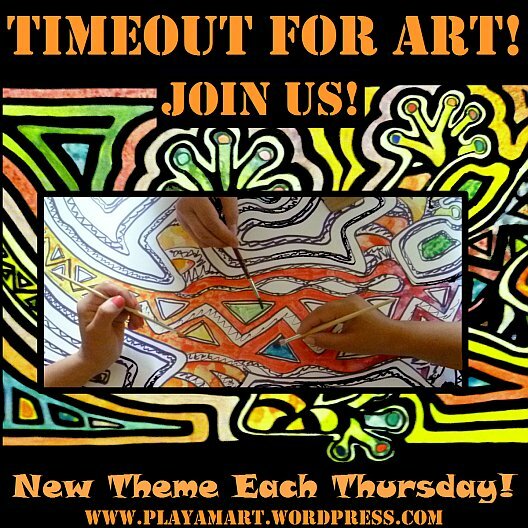 every so often something happens, and we know that we are exactly where we are supposed to be; if my posts are helping you rediscover your love for painting, then i am right where i am supposed to be in life! although you haven’t been painting, you have been incubating, and those periods are important. we break out of the ‘rut’ and reconnect with a more serious side. i do not paint well if there are tasks that seem more important.. i have to clear the slate, and then i am 100 percent focused! This is beautiful. Lovely and soothing post. I think ET himself posed for that! Very single piece of yours is fabulous! Wonderful watercolor. the ancients certainly had a great sense of humor! that little piece is about the size of someone’s hand, but it’s full of character. i’m not sure what the round circle is ‘about” on his forehead. without being able to hold/inspect the artifact, it’s hard to tell if it just happened while ‘firing’ or if there was pigment or a different kind of clay. i am glad you enjoyed the post! thank YOU for taking the time to comment! i’m glad that you liked the paintings. 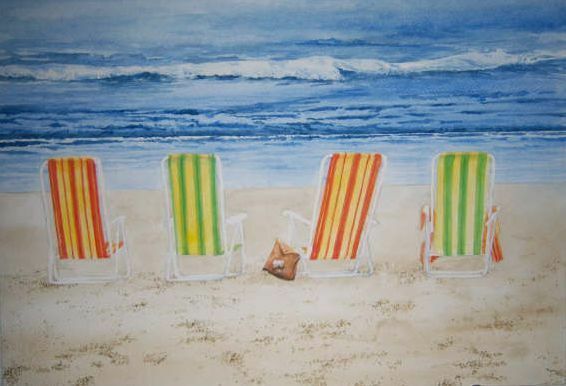 Beautiful watercolors….I love the beach chairs, what a fantastic gift that was! The comments that follow you post are as interesting as what came before – almost anyway. All of a piece. Creation begetting creation, even if, as you say, it’s still in the incubation stage. Wonderful! Thanks! Wonderful work, Lisa, thanks for sharing. thank you! hours and hours and hours ‘behind the brush’ is the secret! Seeing your stages of painting a figurine on paper is believing. I can understand why someone wanted to know how you embedded pottery in the paper. To bring out the depth in watercolor is a feat and you have mastered it. Beautiful! thank you! i worked on a fun painting today, and it is so nice to have reached a level where it’s all easy! the partnership between hand and eye is so important, but there’s a more elusive ingredient that i can’t quite explain, but when you find it, it rarely fails. i’ll be traveling tomorrow and would much rather be home and working on the painting! Your talent amazes and inspires me. There is a life to your paintings and photography that says you love every step. thank you marylin! you see that because you are wired the same way! i hope that 2013 brings you much happiness.